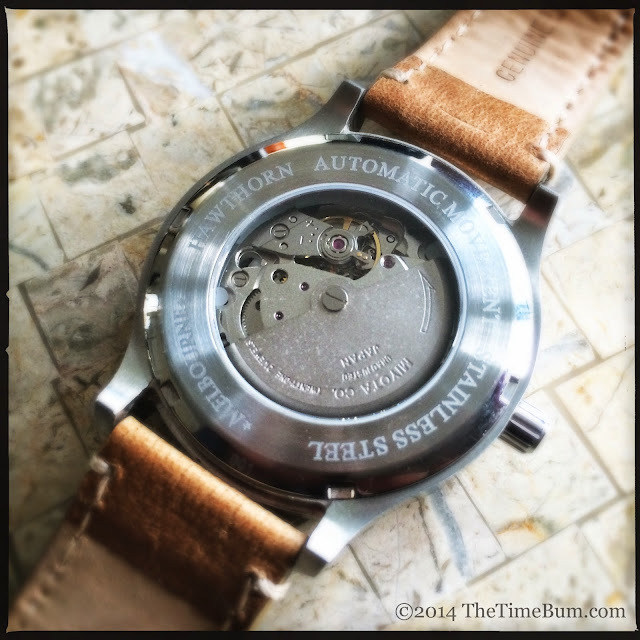 Sujian Krishnan of the Melbourne Watch Company has been keeping me busy. I have already reviewed the highly successful Flinders, and now I have a prototype of the Hawthorn in my hands. This is Melbourne's second model. As you recall, I was rather taken with the initial photos and specs. It seems I was not the only one, because crowd funding wraps up today and it has generated more than 300 per cent of its initial goal. Now that I have seen the Hawthorn for myself, I can safely say those backers will be quite pleased with what their $295 AUD (@ $275 USD) has purchased. 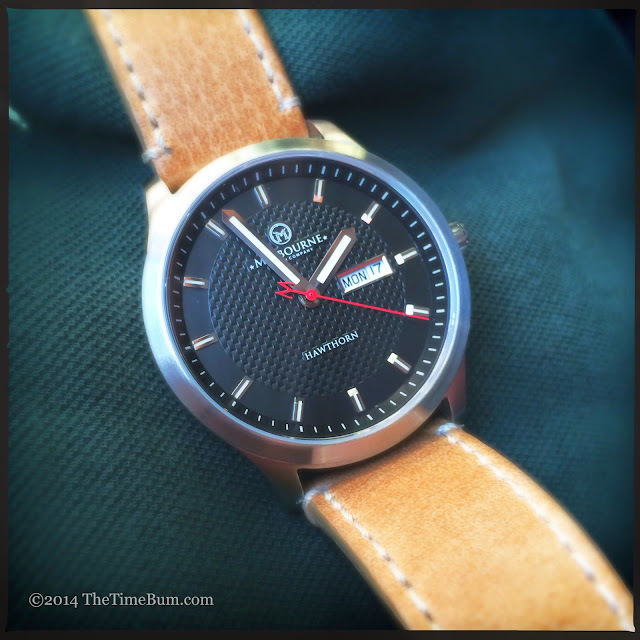 The new watch has a sportier and less formal design than the Flinders, and is less expensive as well. It uses a Miyota Cal. 8205 automatic movement, instead of the 9015 in the Flinders. The 8025 may lack some of the 9015's smoothness, but its 21.6k beat rate and 42 hour power reserve are more than adequate. It is also more rugged than its fancier sibling, with a screw down crown and 100m water resistance. This is a significant improvement over the Flinders's push-pull and 50m rating, and indicitive of how the different watches are intended to be used. At 42mm wide and 12mm thick, the Hawthorn is sized appropriately for a modern sport watch. I found it easy to wear on my modest 6.5" wrist, thanks largely to its 48mm height. The case is brushed stainless steel, with flat sides, a flat sapphire crystal, brushed bezel, and curved lugs, creating a solid, purposeful appearence. The prototype reviewed here had the original, narrow crown. This is really the only objectionable element of the design, and one that has since been remedied. The picture below was posted to the Kickstarter page in a later update and it shows the new crown design, which is broader, flatter, and far more appealing. The dial is only available in black, but I don't think you will find it boring. Its pronounced carbon fiber texture manifests as a basket weave or raised dots, depending on the light. The polished, rectangular hour markers are flat on top, then steeply angled at the inner end. A narrow channel in each is filled with C3 Super Luminova, as are the broad, polished pencil hands. A black-on-white day/date complication sits at 3 o'clock. I normally prefer a white-on-black day/date on a black dial, but in this case the white works well with the color and size of the hands. The M-tailed sweep hand adds a welcome pop of red. 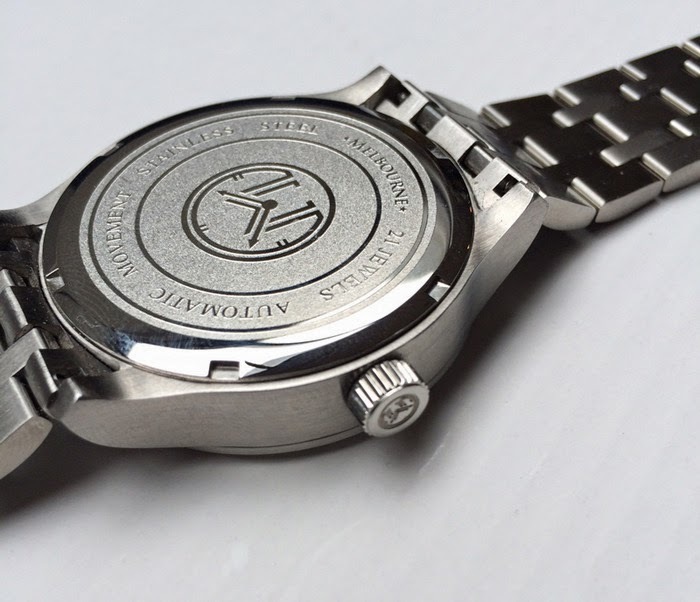 This is not a dress watch, but it is a subtle design. It is a watch you could wear it every day, easily transitioning from office, to evening, to weekend. 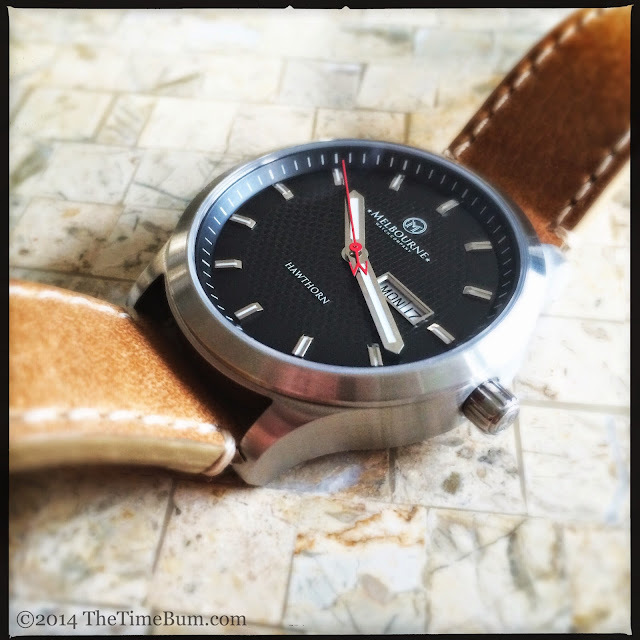 The prototype came on a leather 22mm strap, tapering to a 20mm buckle. The tan leather and contrasting stitch pairs handsomely with the blcak dial and red second hand, creating a smart look for casual to business casual dress. 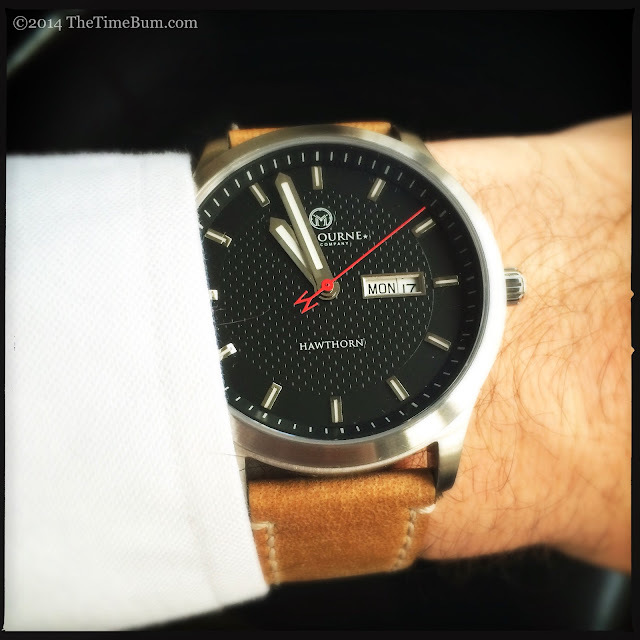 Swap on a black padded strap, and you can wear the watch with a suit. On the other hand, canvas or sail cloth would make an interesting casual look and play off the texture of the dial. If you really want an every occasion solution, a stainless steel bracelet is available, but I did not have the chance to try that myself. With the Flinders and Hawthorn in his line up, Sujian is proving to be a formidable designer in the indie watch world. 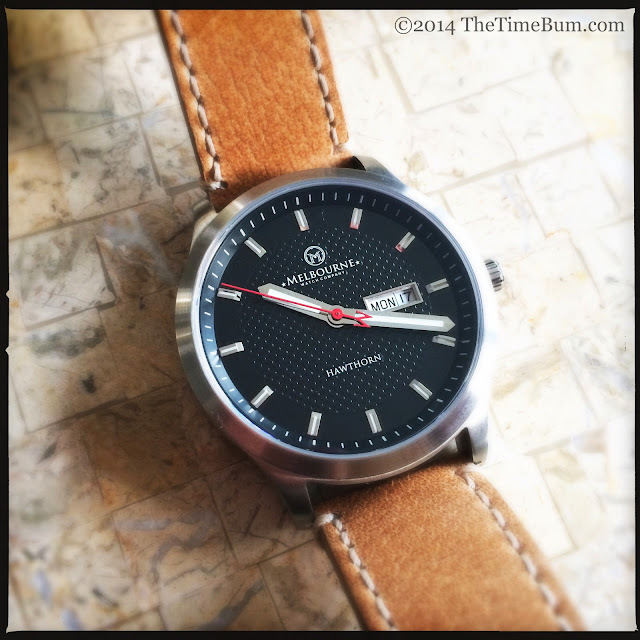 The Hawthorn is yet another sophisticated watch from Melbourne. It is an impressive value even at the expected list price of $395 AUD (@ $368 USD), doubly so at the $275 USD pre-order. Pro: Subtle and balanced design. Con: Not much, but a black day/date might have been nice. Sum: Yet another winner from Down Under. The Time Bum approves.